Prathu's Food: Khara rice/puliodare - Passionate Cooking for Vegeterian Food. Dry roast red chilies, fenugreek seeds, coriander seeds and desiccated coconut till you get a nice roasted aroma. Dry roast the sesame seeds separately. Keep aside to cool. Cook rice and make sure the grains are separate from each other. Keep aside. Soak tamarind in little water and collect the juice and discard the pulp. Heat oil in a wok and add mustard seeds let it splutter add remaining all the ingredients mentioned under Tadka. As the dal starts getting brown, add tamarind juice and salt and let it boil. Cook till it thickens and oil starts leaving the sides. Aunthentic Puliodhare tamarind paste is ready. Spread rice in a big plate ans add spice powder and Puliyodhare paste as required. You can adjust both as per your choice of spice and sour. Puliyodhare is my weakness and I cannot have enough of it. Making puliyodhare from scratch and getting that perfect balance of spicy, tangy at the same time is an art. Who needs the packet stuff, when they can make a delish version from your blog. I have very fond memories of Puliyodhare during my 5 year stay in Hyderabad. 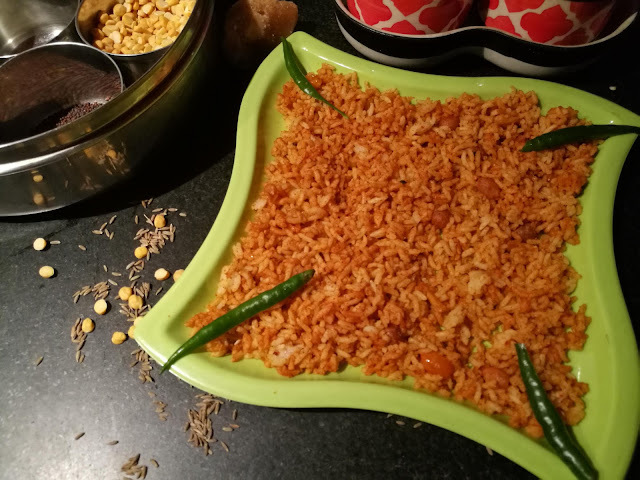 It was there when I fell in love with this tamarind rice and learnt to cook it aswell. You have done full justice with the ingredients by making this dish Prathima. The khara rice looks very inviting and can imagine how flavorful it must have been with your homemade spice powder. Khara rice was the one we hogged on from a class mate who gets to go home every weekend from the hostel. her mum will send a truck load of this which gets polished off in no time.yours looks just the same. I've not actually made tamarind rice at home but have tasted it. Its so delicious and your click is tempting me to try making it at home. Hard to resist to this tangy rice, all time favourite, i can have this rice even everyday, just love it. Serve me with some potato fry, i wont say no at all. First time I tasted this rice around 7-8 years ago, since I make it and it is my daughter's favourite. You have made so perfectly. I love this recipe!Its a common prasad item of the many south indian temples.You have so perfectly captured the essence of this delicious recipe! well made puliyogarai. I love all varieties, esp the ones from Karnataka.. each one is unique in its own way.. This is delicious, the fragrance of it is so good. Lovely share.